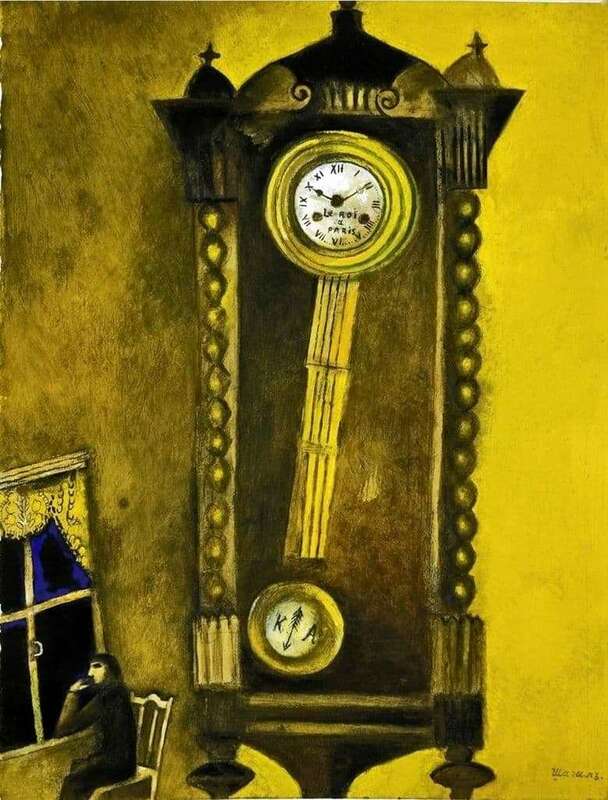 “Watch” by Marc Chagall – one of the most mysterious and eye-catching works of the master. The canvas causes a slight sadness, anxiety and a sense of wasted time. Almost the entire space of the picture is occupied by the image of a massive wooden clock. The watch has a brown tint, typical of wooden texture. Black and brown brushstrokes alternate with yellow blotches, originating from the bright yellow background of the room. This color scheme gives the canvas anxiety and a sense of enclosed space. A ticking clock symbolizes time as a huge construction, not subject to desire, hope and other human feelings. The massiveness of the construction is underlined by an unnaturally small window in the lower left part of the picture. The black and blue symbols behind the glass create a contrast to the yellow color. Above a small, slightly curved window one can see yellow curtains with small ornaments. It seems that all elements of this room are made in a single color scheme in order to depict the closedness, monotony and emptiness of space. Near the window you can see the same underestimated dark figure of a man, looking thoughtfully into the distance. This image is most disturbing: what is this person thinking? It seems he feels an incredible longing, sadness, emptiness. He was left alone with a huge ticking clock, reminiscent of the inexorable passage of time, about the moments that were left behind. A simple person seems to be a small, insignificant element against the background of the whole element that absorbs everything that exists, sweeps up all that was expensive with the sands of time.